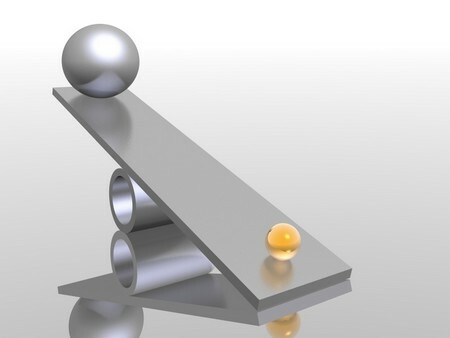 A seesaw is nothing more than a board with a long slender plank perched in the middle so that the ends go up and down when weight is applied to the other end. In practice, a rider sits on each end and each in their turn pushes their feet against the ground to lift their end up into the air, dropping the other end to the ground. Seesaws usually have handles in front of each rider to hold on to as they face each other. Building a seesaw is as easy as the instructions below indicate. Shovel, hammer, level, tape measure, staple gun, pencil/paper, wood and metal drill. To start off you must construct a solid foundation for your seesaw. Level out and area of ground about 20´x 20´ and dig two holes in the center at least one foot wide and six feet deep. Set your tubes into the holes. Keep the peak of the tube about 3” underneath the ground. Connect your anchor to allow perpendicular supports. Now that you have finished the foundations, it is time to build the posts. Take the one-piece metal U-post system or simply two vertical posts joined by a metal pipe and bolted on to the ends to a steel/wooden post system. Attach the posts to the foundation. Once the posts are attached, pour your concrete, sand and water mix into the holes and completely around the posts. Make sure that the posts are exactly at right angles to the surface. Allow your concrete 24 hours to set before attaching the posts to the foundation. Now you have to decide on the length of the lever. You can use metal or wood but you need to wrap the lever with padding and if you chose wood fasten a metal strip to the base of the stock to provide firmness. Bore holes for the seat on both ends. Place your handles by drilling a hole in the level arm about 18” -24” from the end of the lever. Drill another hole in a 1” X 2” piece of stock. Attach the vertical beam into the parallel lever and then add your cross piece to the upright beam as a handle. At the end of the seesaw, both sides, attach a piece of foam covered with leather to serve as seats. Now sand down the sharp edges of your foundation, lever, handles, etc. Paint your seesaw using non-lead based paint.